Domesday does not record either a priest or a church at Stanton on the Wolds The first rector was appointed in 1280. The church is built on the highest point of the parish. 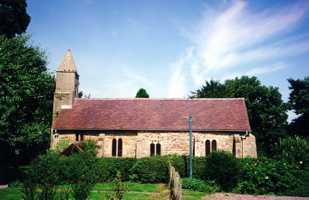 The earliest fiscal reference to a church here is 1341 whilst the oldest fabric in the building is also fourteenth century. The font may be of earlier Norman workmanship. The medieval village lay between the church and the manor house to the west. Following sixteenth century enclosure for sheep farming, the village houses were dilapidated and the village became deserted. The manor house, which belonged to the Clifton family, was occupied during the seventeenth century and the early part of the eighteenth century by gentle folk. Sir John Parsons lived there with his wife, Dame Catherine, a Clifton heiress. He was buried in the chancel in 1704. Their successors, the Bowskill family, were buried in the churchyard. During the ensuing centuries, with no resident lord of the manor and the decline of the manor house into a farmhouse, the church was allowed to deteriorate. From the late eighteenth century, visiting historians described the building as very poor. Restoration work, needed to re-open the church, was carried out in 1830. A complete restoration was performed in 1889. Repair work was done in 1951 after a successful appeal to save the ivy-covered church from closure. A vestry was added in 1977. The outward sloping walls are a notable feature of this church and, despite the presence of late nineteenth century buttresses on the south wall, were probably constructed this way. The reason for this form of construction is not known. It is likely that some of the stone windows were reused from other churches. In particular, close inspection of the east window reveals that its width is about 10 cm. shorter than the opening into which it has been built. Today, this lovingly cared-for small church lies across a field, formerly part of the glebe and now containing a car park for the congregation. It is approached from Browns Lane, along a driveway at the side of farm buildings.